1) Let them do the environmental review before we just worrying about the environment. Gotta call it a streetcar, though, or Highlandites can't pretend they're a picturesque village instead of a neighborhood in a city. I wonder how much of the "streetcar" designation is simply trying to avoid the stigma surrounding current LRT projects. they can't call it light rail as it's mixed traffic. As much as I'd love to put "old" blue line LRT vehicles and label it as "street car line" since it's in a car traffic lane, however seems more logical to just use buses and combine it with the Red line. Even if that means the Red line looses the Ed, and just becomes the R Line. (as it be a rapid bus line instead) I'd be at peace with that. Even if the all the busses don't go all the way down to the tiny apple transit station! Outside of rush hour. Thought maybe I'm talking about slapping more expensive paint on an old worthless failed red barn. Could be, or could be the paint is just enough to keep it standing against a few more guests of wind. hah! hmm I might be keeping an eye on this. Also the article got me wondering, did TCRT have any significant stops/station buildings at or near Fort Snelling? Cause if there was one it might be a little neat if they could recreate it with some added amenities. They did have streetcar stops inside the (at the time, much larger) fort, but no big stations. Of course, the bridge that carried them was much farther east than the current one; it was almost to the pentagon north central tower. And, the walls and most of the original buildings of the "historic" fort were no longer there. It is mixed traffic for a small portion of the route, San Francisco has light rail that had dedicated ROW and shared ROW. 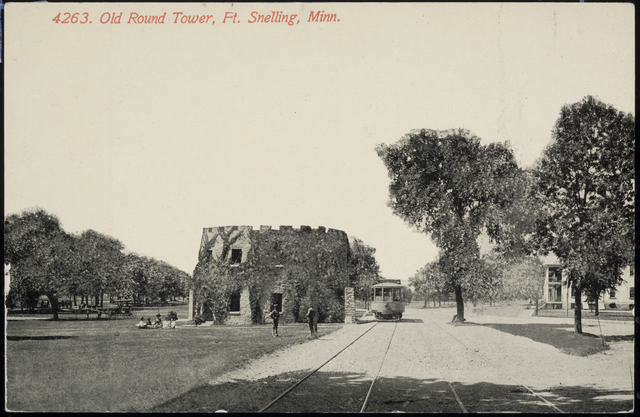 If I'm not mistaken, Fort Snelling at one point had its own streetcar shuttle that connected the length of the upper post to the regular route TCRT. I'll have to dig out the map in my copy of the Aaron Isaacs' Twin Cities By Trolley. Riverview is officially in the 2040 Transportation Policy Plan, and is now eligible for federal funding. As well it now moves into Environmental process. oh the Strib comments... Maybe by 2025 we will realize it has to be dedicated right of way. We have literally 11 years to make dedicated right of way work. Figure it out. This will be a bad project if Ramsey County decides that "streetcar" means that it should be built and function like an entirely separate service, mimicking the standalone (and failing) modern streetcars of cities like Atlanta, Cincinnati, Oklahoma City, Tucson, and beyond. I'm terrified that this will be a project marked by shared ROW, too-close stations, stations that are basically just raised curbs with a sign, and smaller cars that look distinctive and cannot be used with the blue and green line stock. My hope is that the career professionals at the Met Council and Metro Transit will push back against Ramsey County's bizarre fixation with making transit less useful, and they will ensure that a service that meets METRO's established standard of quality will be built. My second hope is that a new President might bring into the FTA administrators who will refuse to fund any more modern streetcar projects. There's a lot of time remaining to get this project right. I really do believe with the connections to the existing METRO system will make this project have the same standards. I think that is also what a planner told me at a meeting about the project. Completely agreed on all counts. I'm cautiously optimistic that the shared ROW segment (if any) will be brief and convertible to proper LRT in the future. One thing that increasingly concerns me (and now I'm going to be the broken record) is the lack of a coherent transit plan for Downtown St. Paul. We've got a staggering number of projects built or in progress that traverse Downtown, with varying degrees of certainty on how they do that traversal: Green Line, Riverview, Gold Line, Rush Line, East 7th aBRT, and Red Rock Line all serve this area, and AFAIK most or all of them started with a mostly-detailed plan but a fuzzy "and somehow deal with Downtown St. Paul" blob tacked on. I think we need a concrete answer to "how will transit projects (of various modes) traverse Downtown St. Paul?" so that we can start making investments that will benefit all these various lines and ensure they don't interfere with each other. We have too many lines converging to not think about this broader context. My naive recommendation would be a dedicated transit mall supporting bus and rail and running on 5th Street between 7th to Central Station and then on 4th Street from Central Station to Union Depot. This would coincide with the existing Green Line tracks, provide a better solution to how Riverview gets from 7th to the existing tracks than the current split plan, serve the circulator part of the Gold Line, and serve buses coming to/from Minneapolis via 94. Like I said, it's probably naive and I'm sure there are flaws in this route, but I'm less interested in arguments against my specific idea and more in why nobody seems to have proposed any similar coordinated, structural plan for this area despite a ton of investments happening there at the same time. 1. The grid is not nearly as consistent as Minneapolis, nor is there lots of excess ROW around Rice Park, etc. 2. The Green Line jog at Central Station introduces more complexity vs a straight shot routing across the core. 3. Ramsey County would obviously want all services to support SPUD, but SPUD is far from the center of gravity of DT and far from where most of these lines plan to enter DT. I'll save the rest of my thoughts for if the DT St Paul topic makes sense in another thread. 1. Use the CP Spur between Randolph and St. Paul Ave, or at least west of 35E. 2. Focus on high-quality stops rather than high-frequency stops. 3. Consider future grade separation east of Smith Ave.
4. Between 35E and Smith, ensure there's a clear path forward towards dedicated ROW in the future. 5. Route the train across a rebuilt Hwy 5 bridge where LRT and bike/ped facilities are on a second level at-grade with E River Road/Shepard and Fort Snelling. 6. (Obviously) plan on a minimum of two LRV trainsets, ideally three. One thing that increasingly concerns me (and now I'm going to be the broken record) is the lack of a coherent transit plan for Downtown St. Paul. I'd probably prefer your concept of turning 5th over to transit, but the current plans are not completely discordant, and I think that's why there hasn't been a rush to propose an alternative. The Green Line represents an existing condition, and the Rush, Gold, and Riverview routes kinda do agree with each other. The idea of split one-way lines is nothing new and works in cities all over. No aBRT nor the Red Rock Corridor is currently in serious planning, and when other projects come up, they can adapt to the existing set-up easily by following the N-S and E-W trails already blazed by the existing projects. There's a lot of synergy already. All three take the existing trunk routes on 5th and 6th as a starting point. Gold and Riverview will stop at or near the existing Central Station and the Union Depot. Both are also envisioned to stop Rice Park and at Kellogg (although, as I mentioned above, I think the Rice Park stop should be eliminated). I haven't seen it made official anywhere, but it's obvious that these stops could and should serve both modes on one platform, just as buses use the East Bank Station at the U. Even though the Gold Line is still in design, Riverview is so far out that it might be tricky to build the(se) Gold Line station(s) to LRT specifications, but I'm sure they could be designed in a way to allow future expansion. The Rush/Purple Line comes into downtown at a slightly different angle, but it will share the Gold Line stations at Robert St, the Green Line Robert Street Station (I think this stop will eventually be renamed), and will also serve the Union Depot. So the only spot where all four services meet is the Union Depot, but that's probably fine, and will certainly make Commissioner Ortega happy. That's encouraging to hear, but I'd like to see more explicit planning and documentation of why this alignment is being chosen for all these routes, what kind of future improvements are possible, how stations are being designed to support all these various services, etc. This is important work that deserves a plan and a budget, not something that can just happen accidentally!